Add some tropical flair to your winter beverage menu with Passion Fruit, Pineapple and Peach Reàl Infused Syrups. While these fruits are far from being in season, Reàl’s perfectly paralleling taste will transport you to warmer weather. These flavors, perfect for both cold or hot cocktails – or mocktails or tea! – are guaranteed to keep customers happy throughout the season. An explosion of tartness followed by hints of sweetness dance across your tongue with the flavor of passion fruit. Unlike other tropical fruits, passion fruit has a certain mystery that will spark conversation from customers. Try experimenting with some of the Passion Fruit Reàl Infused Syrup recipes below. 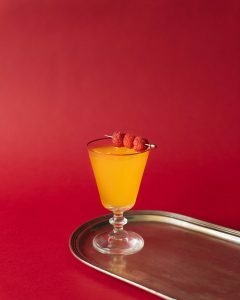 Pineapple flavor is a pleasantly unexpected addition to any beverage or cocktail. 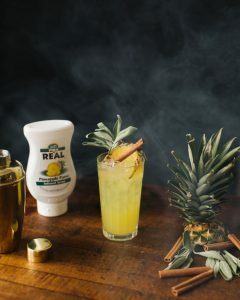 Its balanced palate of sweet and tart is captured in each bottle of Reàl Pineapple infused syrup. This tropical fruit doesn’t have to be savored only during warm days spent on the beach. With Reàl, you can mix up cocktails for everyone to enjoy all year long. Below are three great recipe ideas to inspire some delicious pineapple concoctions this winter. mixing glass filled with ice. Biting into a peach fills your mouth with a wonderful, juicy flavor, incomparable to any other. 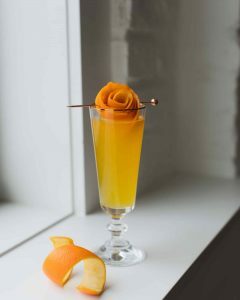 Peach Reàl Infused Syrup has captured the delicate peach flavor, and while the fruit may not be in season, Reàl has your cocktails covered. Below are three great recipe ideas that can be enjoyed with and without alcohol to inspire you to keep peach on your menu through the cold months.